On November, 2013, the commemoration day of St. Hilarion the Great, Metropolitan Hilarion of Volokolamsk, head of the Moscow Patriarchate’s department for external church relations, who heads the Russian Orthodox Church’s delegation to the 10th Assembly of the World Council of Churches, celebrated the Divine Liturgy at the Russian general consulate in Busan. He was assisted by Bishop Feofan of Kyzyl and Tuva. Concelebrating with the two archpastors were Archimandrite Philaret (Bulekov), a DECR vice-chairman, Rev. Iliya Kosykh, acting head of the DECR communication service, and Hieromonk Ioann (Kopeikin), assistant to the DECR chairman. 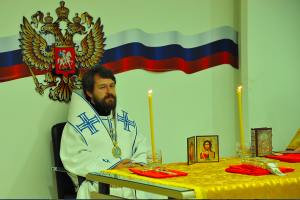 Among the worshippers were members of the Russian Orthodox Church’s delegation, Russian general consul in Busan V. I. Moshkutelo, the consulate staff and compatriots residing in South Korea. After the dismissal, Metropolitan delivers an archpastoral homily devoted to the Eucharist as a sacrament “which unites us, dispersed throughout the world, into one Body of Christ”. “Therefore, let us try to resort to the Holy Eucharist also during our travels. If there is no Orthodox church nearby, let us look for a Greek church or go to another Orthodox church even if it is hundreds of kilometres away. If there is no Orthodox church, let us create it where we are, just as we have turned the Russian consulate into a church of God”, he said. Speaking about the participation of the Russian Orthodox Church in the WCC Assembly, Metropolitan Hilarion said, “I wish that we participate in the assembly properly, bearing witness to the Orthodox faith before our non-Orthodox brothers and sisters, so that we could say all that the Lord puts in our mouths and we could hear all that we need to hear and so that the experience gained here may help us in our further service in this land”. After the service, Metropolitan Hilarion met with expatriates living in South Korea.